Myo Engine is a small 3D Engine on which I'm working in my spare time. It is a personal hobby project and non-commercial. With the help of this engine I created a simple first person shooter, called Smash, in which you can play against a primitive AI enemy. The main intent was to create a game, in which I can test the features of my engine. 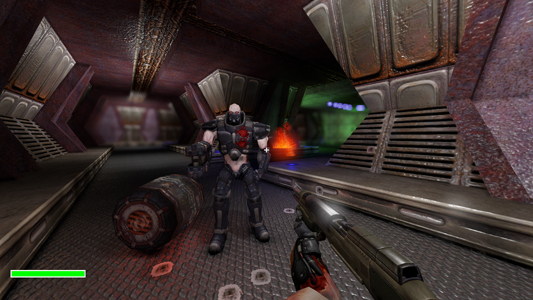 Below you can see an in-game screenshot (please note that textures and models are either from Quake 3 Arena (by id Software) or from Quake 4 (Raven Software/ id Software)). It is written in modern C++ and currently only targets Windows PC. By using a clean renderer interface it supports both DirectX 11 and OpenGL 4.4. Both renderer implementations have the absolute same feature set, supporting advanced features of shader model 5.0 compatible graphics hardware. The only middleware used is Havok Physics for physics and FMOD Ex from Firelight Technologies for audio.